Sometime back in the late 1940's, I, like a lot of kids, got a couple of little live chicks for Easter. Normally the poor things died after a few weeks. However at one point in time the chicken I had continued to live a long time. We lived in a three room apartment and my bed was in the living room where I kept the chicken. When the chicken got too big for the cardboard box I kept him in my father brought home a large wooden crate - the type that vegetables came in and that had plenty of openings for air to circulate well. 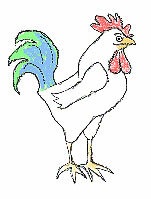 The chicken grew tall, the feathers turned white, and it had a red crown on top of it's head. It had turned into a rooster. One Sunday morning it started crowing. My father said "That's it - the chicken has to go." Of course I was upset, but my parents still didn't know how they were going to get rid of the chicken. My mother spoke to Danny, our Iceman, who came by every few days on his horse and cart and delivered ice to us. Danny said to my mother that he would take the chicken, kill it, and bring it back for my mother to cook. My mother told him that we could not eat the chicken that we raised, so Danny took the chicken and I guess ate it himself.